Grammy trophies sit in the press room during the 60th Annual Grammy Awards on January 28, 2018, in New York. 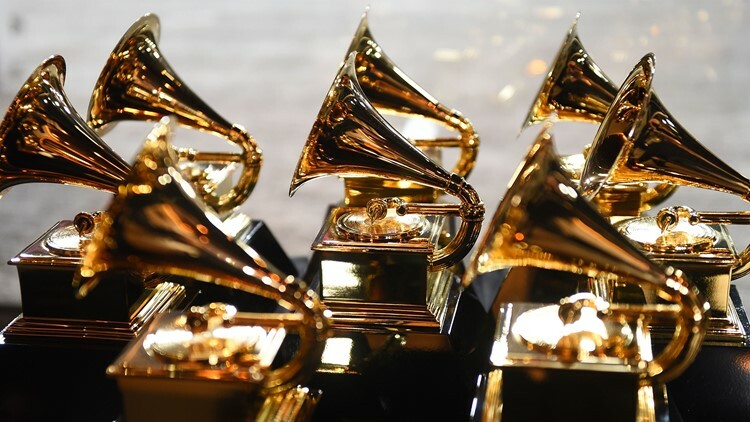 The 2019 Grammys will be held on Feb. 10. The Recording Academy delayed unveiling the nominees by two days because former President George H.W. Bush's funeral and public viewing this week in Washington. The Grammys announcement comes a day after the Golden Globe nominations. Several music superstars, including Lady Gaga, Dolly Parton and Kendrick Lamar, were all nominated for Globe awards in the best original song for a motion picture category. Select Grammy nominees will first be announced on "CBS This Morning" and Apple Music at 8:30 a.m. Eastern. A full list of nominees in 84 categories will be available at 8:45 a.m. Eastern on www.Grammy.com .